Looking for a lost child. Lisa Jiang, after much delay, released Lie, the movie that stood between her and her BA from Temple, to the public. I was curious to check it out because it was supposed to chronicle the struggles of an immigrant Asian family in the States; as a member of an Asian (fine, South Asian) immigrant family, I think I have at least some authority as to what is realistic or not. 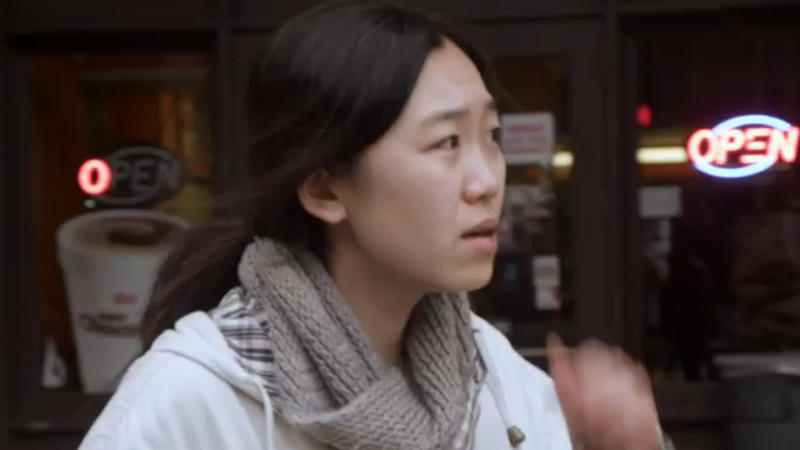 In doing this chronicle, Lie depicts Ying (Siying Chen) as she quite literally loses her daughter Amy (Lina Zeng) in the streets of Philadelphia after an argument. Lie was a gorgeously shot movie. The camera was handheld for much of the movie, and the shot compositions, where much of the movie took place in the streets of Philadelphia, were a treat to look at, despite it looking quite cold. Philadelphia does have the advantage of having train stations that are better taken care of than its utilitarian counterparts in New York City. I need to reiterate that this movie was Lisa Jiang’s senior thesis at this point, because man it shows in the writing! The movie advertised itself to depict the struggles of Asian immigrants as a result of (possibly) having entered the country illegally using Ying as an archetypical Asian immigrant. The problem was that I went through the almost 15-minute runtime expecting a major conflict….only for it to never happen. The movie wasted a lot of time on the initial exposition, but I didn’t see anywhere Ying having a hard time aside from a massive language barrier (despite the fact that she could understand Amy, who spoke fluent English the entire time). The whole runtime felt like a beginning without a middle or end. I found the central family’s dynamic a little odd. For one thing, the 21-year-old Chen looked way young to be Amy’s mother. I thought my parents were young when they had me, but my mom was already in her early thirties when I was the age Amy was supposed to be. I was a little perplexed that Ying could understand Amy just fine, but had issues with the English spoken by a random dude trying to help her. Also, who the heck is Amy’s father? Having recently completed my own senior design project, which stood between me and my BS from Cornell, I can see why Lisa was hard-pressed for time. I personally think she would have been better off with just sticking to a very basic three-act structure and just filling the blanks in if she was having such a hard time getting a complete story in the time she had. The movie was technically competent, with serviceable acting from Chen, but I came out of the movie feeling a little empty.